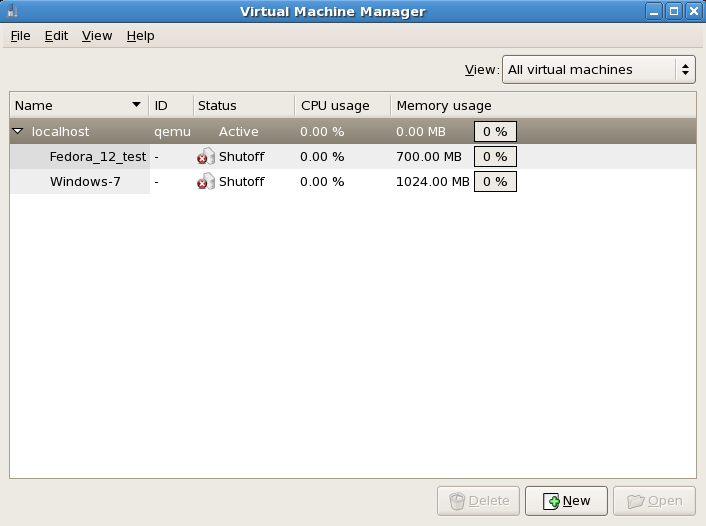 virt-manager, also known as Virtual Machine Manager, is a graphical tool for creating and managing guests. 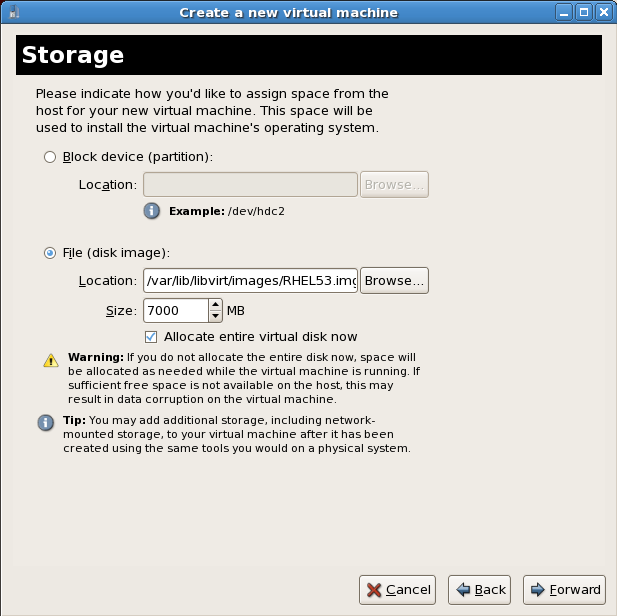 The virt-manager window allows you to create a new virtual machine. Click the New button to create a new guest. This opens the wizard shown in the screenshot. Review the information for your installation and click the Forward button. 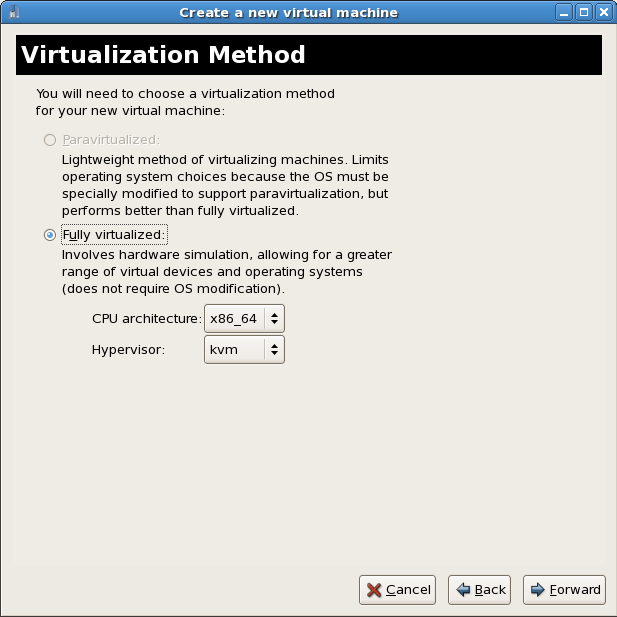 The Choosing a virtualization method window appears. Choose between Para-virtualized or Fully virtualized. Full virtualization requires a system with Intel® VT or AMD-V processor. If the virtualization extensions are not present the fully virtualized radio button or the Enable kernel/hardware acceleration will not be selectable. The Para-virtualized option will be grayed out if kernel-xen is not the kernel running presently. If you connected to a KVM hypervisor, only full virtualization is available. 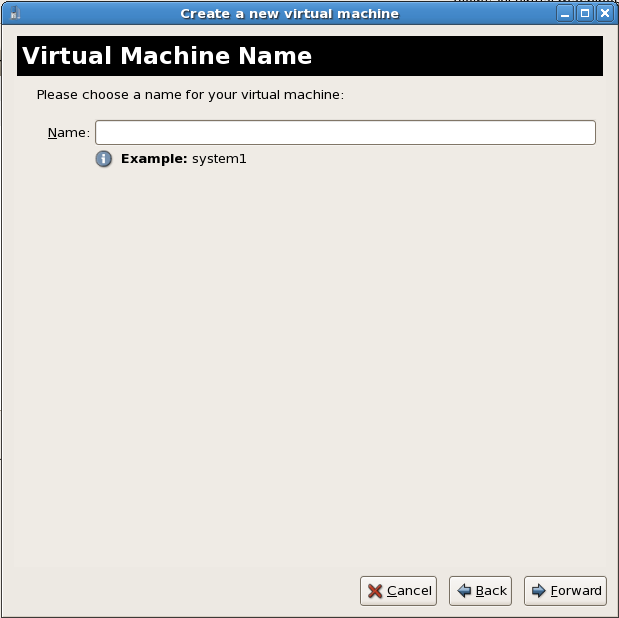 Choose the virtualization type and click the Forward button. The Installation Method window asks for the type of installation you selected. This method uses a CD-ROM or DVD or an image of an installation CD-ROM or DVD (an .iso file). This method uses a mirrored Red Hat Enterprise Linux installation tree to install guests. The installation tree must be accessible using one of the following network protocols: HTTP, FTP or NFS. The network services and files can be hosted using network services on the host or another mirror. This method uses a Preboot eXecution Environment (PXE) server to install the guest. Setting up a PXE server is covered in the Red Hat Enterprise Linux Deployment Guide. Using this method requires a guest with a routable IP address or shared network device. See Chapter 10, Network Configuration for information on the required networking configuration for PXE installation. Set the OS type and OS variant. Choose the installation method and click Forward to proceed. 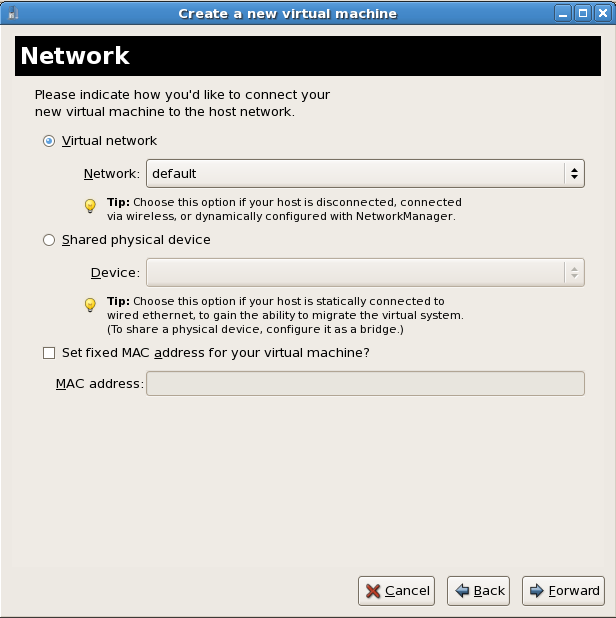 Para-virtualized installation must be installed with a network installation tree. The installation tree must be accessible using one of the following network protocols: HTTP, FTP or NFS. 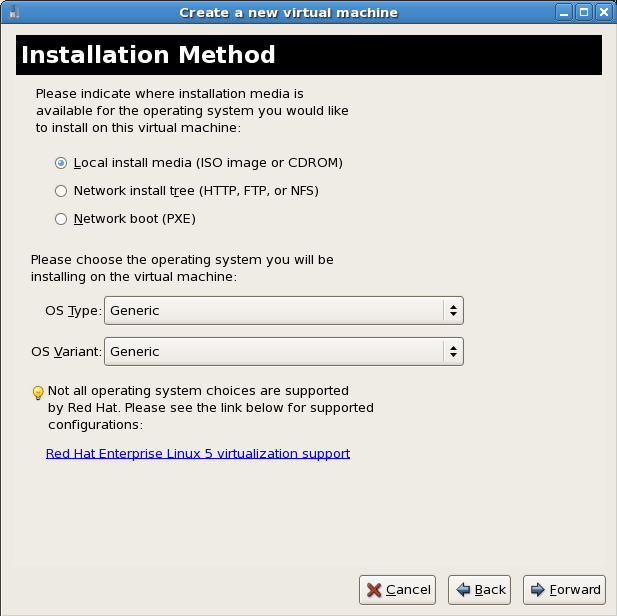 The installation media URL must contain a Red Hat Enterprise Linux installation tree. This tree is hosted using NFS, FTP or HTTP. This window is dependent on what was selected in the previous step. If Local install media was selected in the previous step this screen is called Install Media. Select the location of an ISO image or select a DVD or CD-ROM from the dropdown list. If Network install tree was selected in the previous step this screen is called Installation Source. Network installation requires the address of a mirror of a Linux installation tree using NFS, FTP or HTTP. Optionally, a kickstart file can be specified to automated the installation. Kernel parameters can also be specified if required. PXE installation does not have an additional step. The Storage window displays. Choose a disk partition, LUN or create a file-based image for the guest storage. Your guest storage image should be larger than the size of the installation, any additional packages and applications, and the size of the guests swap file. The installation process will choose the size of the guest's swap based on size of the RAM allocated to the guest. It is recommend that you use the default directory for virtual machine images, /var/lib/libvirt/images/. If you are using a different location (such as /images/ in this example) make sure it is labeled according to SELinux policy before you continue with the installation. See Section 19.2, “SELinux and virtualization” for details. Guests require sufficient physical memory (RAM) to run efficiently and effectively. Choose a memory value which suits your guest operating system and application requirements. Most operating system require at least 512MB of RAM to work responsively. Remember, guests use physical RAM. Running too many guests or leaving insufficient memory for the host system results in significant usage of virtual memory. Virtual memory is significantly slower causing degraded system performance and responsiveness. Ensure to allocate sufficient memory for all guests and the host to operate effectively. Assign sufficient virtual CPUs for the guest. If the guest runs a multithreaded application, assign the number of virtualized CPUs the guest will require to run efficiently. Do not assign more virtual CPUs than there are physical processors or threads available on the host system. 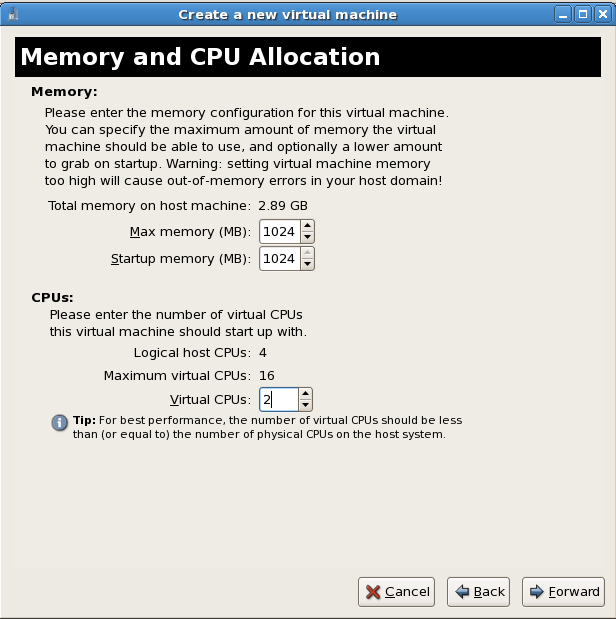 It is possible to over allocate virtual processors, however, over allocating has a significant, negative effect on guest and host performance due to processor context switching overheads. 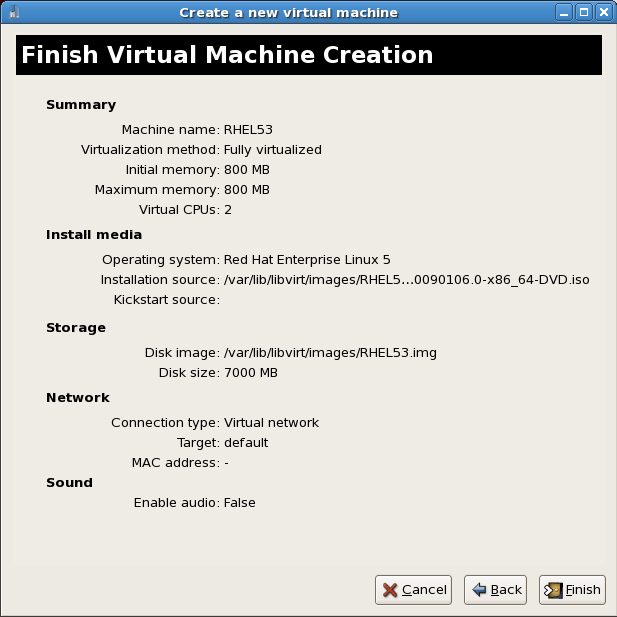 The Finish Virtual Machine Creation window presents a summary of all configuration information you entered. Review the information presented and use the Back button to make changes, if necessary. Once you are satisfied click the Finish button and to start the installation process. 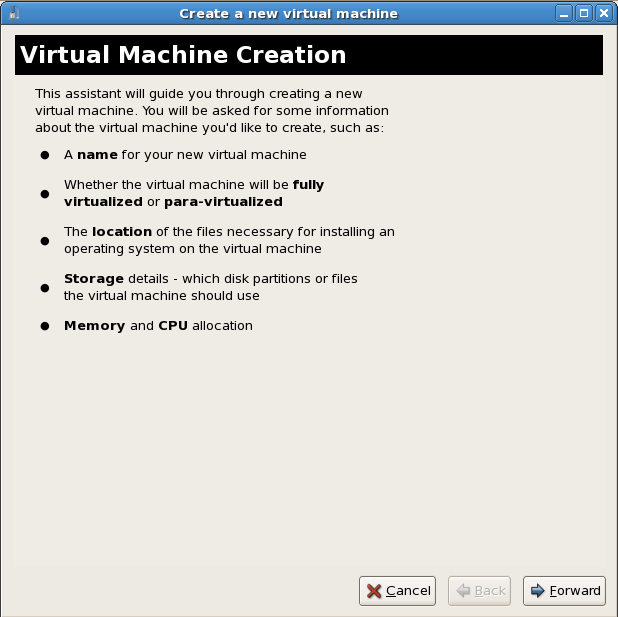 A VNC window opens showing the start of the guest operating system installation process. This concludes the general process for creating guests with virt-manager. Chapter 8, Guest operating system installation procedures contains step-by-step instructions to installing a variety of common operating systems.